I know this is a goofy post, but I wanted to express why I wanted to host NAUCC 2013, or rather why NAUCC has become so important to us. So, please bear with me and muddle through any sappy sentiments...most of this isn't new to any of you. A number of years ago, Dave decided that a unicycle was the one cycle he had yet to master. So he taught himself to ride. Then he heard about this crazy event, Ride the Lobster. He thought it sounded like fun. And it was, but first he had to do a qualifying ride, be accepted and form a team. So he did all that and we went to Nova Scotia for vacation that year. 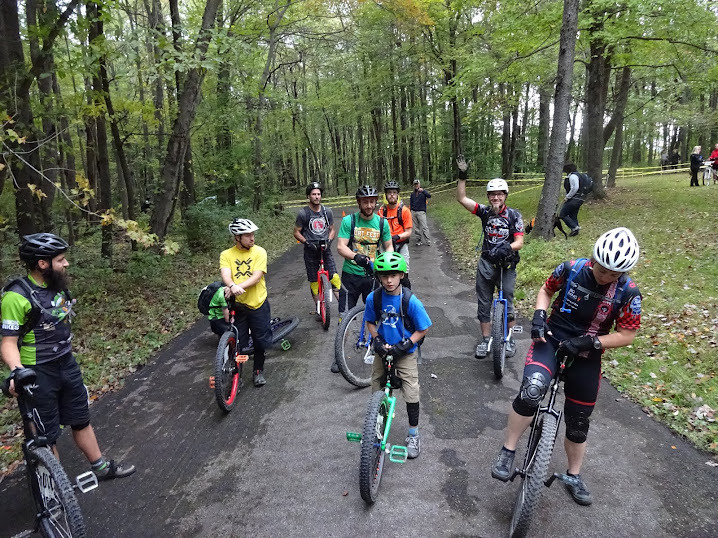 It was a great chance for us to meet a whole group of international unicyclist who were and remain just as unbalanced as we are (pun intended). After that adventure, I learned to ride. I was convinced during a conversation at Ride the Lobster, that I too, despite my vertigo issues, could learn to ride. The next summer (2009) we went to NAUCC for the first time, having never even heard of Unicycling Society of America or NAUCC prior to Ride the Lobster. Dave registered as a competitor, me as a non-competitor because I still felt that I wasn't able to ride well enough to compete. We were both amazed at how the learning curve changes when you are surrounded by others who ride. We both came away with an appreciation for the national organization and an understanding of how hard it is to learn and grow as a rider living in "a bubble". The friends we made that summer are now some or our best friends - the internet has been great at helping us keep in touch. We figured that if we can get to NAUCC with in a 2 day drive, we will be going to NAUCC. We missed 2010 for this reason, and because we were helping organize the Butler County Stage Race. Briefly, the BCSR was a 3 stage race that included a Time Trial, Crit and Road Race. It was bicycle specific and attracted semi-pro riders from all over the country and the world. This type of race is more common in Europe and the West Coast, making it a big deal here. We were able to hold uni races in conjunction with the bicycles - we used the same courses and the same officials. Somewhere along the way we started a "club" at the local YMCA - The Butler Wobble (a wobble is a pack of unicyclists). We meet regularly from about October - May and have about 15 - 20 riders each week. We've attended the 2011 and 2012 NAUCC events and I've been more and more excited to attend each year. Now I register as a competitor and am glad I do. We've learned that the biggest benefit of attending NAUCC is the people. When you're surrounded by that many people who all love to ride unicycles, it's hard not to be inspired to continue learning new tricks and moves, to try and go faster, to try a different sized wheel. And the amount of encouragement is contagious. I understand more and more why NAUCC is the annual family vacation for so many people and I hope it remains that way for a long time. I've started looking forward to NAUCC the way some people looked forward to summer camp as a kid. I get to catch up with old friends and meet new people who all share the same love of unicycling. It's very refreshing to be surrounded by that many people who like something that you like. NAUCC's are also an amazing opportunity to see what is possible. The boundaries get pushed each year and in doing so, encourages each of us to continue to learn and improve. It's also exciting to see the world of uncycling evolving. Dave & I come from a bicycle racing background (Dave races, I watch and volunteer) so watching and participating as the uni world moves more into the racing realm is stressful and exciting. Sometimes I'm not sure what occurs at the national level, but I do know that NAUCC events are worth the trip. It's hard to explain, but without all the people working together on a national level, I suspect that those who are working hard on the local level would be duplicating each other work and the UNIverse would get stagnate. Knowing that there is a national group of people working towards improving what we do and sharing information with other riders keeps me interested in riding and moving the national organization forward. With the advent of the internet enabling everyone to stay connected, I think it's even more important to have a national organization that can corral all of what's going on. NAUCC seems like an efficient way to do just that. The web is great, but seeing something live is so much better and having the ability to talk face to face with someone will always be much more advantageous to the learning curve. I'll stop there, because I'm not sure where this was going or where it's headed.